Caudal’s debut album now available for pre-order! Time to wake up from your hibernation and leave your holes! Caudal’s debut album “Forever In Another World” is now available for pre-order! Shipping will start exactly two weeks from now, from 23rd April onwards. 4 tracks with a total running time of 42 minutes, influenced by Space Rock, Krautrock, Post-Punk, and Math-Rock. 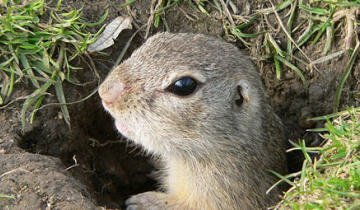 The album is dedicated to the little fella on the picture – the European ground squirrel. All profits will be donated to the respective protection fund of the Austrian Union for Nature Preservation. 500 copies on 180g black virgin vinyl, produced as environmentally friendly as possible. Each album includes a download code. Buy your copy here. A very limited number of 8 test pressings on 180g black virgin vinyl is also available here. If you have ordered from the Oaken Palace before, you will notice a slight decrease in shipping costs, especially when you buy more than one record. So make use of it and order the fantastic album by Parallel Lines as well!